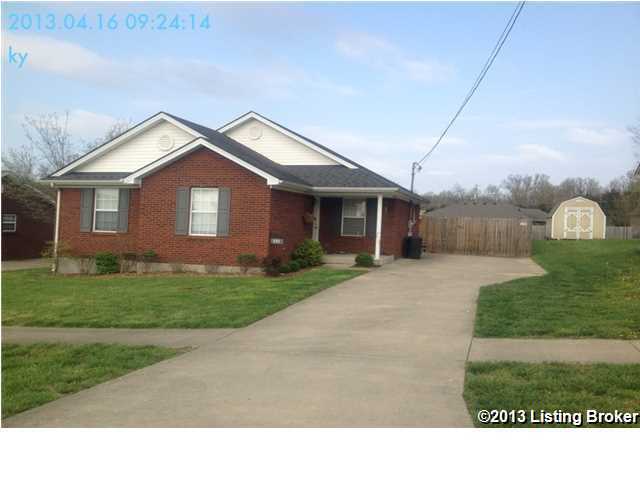 Let's go take a look at this nice three bedroom two bath brick ranch conveniently located in town. Home features 1080 sq. ft. of comfortable living space. Eat in Kitchen with nice cabinetry & comes equipped with dishwasher, microwave, refrigerator and range/oven. Well maintained with tasteful decor. Nice fenced back yard with rear deck & outbuilding for additional storage. Call today for your personal tour of this great home. Cottage Grove is a subdivision within the city of Bardstown, Kentucky. There are currently 3 Homes for Sale within Cottage Grove, with asking prices ranging from $169,900 to $169,900. The average list price per square foot of the available inventory in Cottage Grove is $126, which is below the Bardstown average of $127. The Average Sales price of all sold real estate in this subdivision for the past year is $87,854. Recent comparable homes have been selling for 96.41% of their asking price. Waterfront homes represent 66.67% of the available Cottage Grove inventory. The population of Bardstown, according to the 2010 Census, is 11,700. The total number of households in the zip code of Cottage Grove is 11,084, with an average household size for of 2.52 people. The total number of renter households within the zip code of 40004 is 3,084, which means that 72.18% of households in this zipcode are owner occupant households. 121 Kentucky Ave, Bardstown KY 40004 is a Home, with 3 bedrooms which is recently sold, it has 1,180 sqft, 0 sized lot, and None parking. A comparable Home, has 3 bedrooms and 2.5 baths, it was built in and is located at 120 Kentucky Ave Bardstown KY 40004 and for sale by its owner at $ 169,900. This home is located in the city of Bardstown , in zip code 40004, this Nelson County Home, it is in the COTTAGE GROVE Subdivision, and Edgewood are nearby neighborhoods.